In a small saucepan combine all ingredients except the cheese. Cook over medium-low heat for 15 minutes, stirring occasionally. Remove from heat and let cool. For each serving, plate 1 slice of cheese. Top with 1/4 of the conserve mixture. Partially overlap with another slice of cheese. 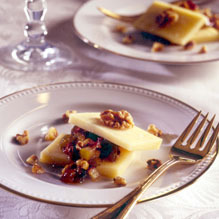 Garnish with walnut halves.